Spence and Davidson go 1-2. Forys nearly sets record. Caroline Schultz of Hilton, NY, the 11th place finisher at the Foot Locker Northeast Regional will be competing at the National Championships in San Diego. The 10th place finisher, Danielle Tauro, has opted to not run the national race, opening a spot for Schultz. 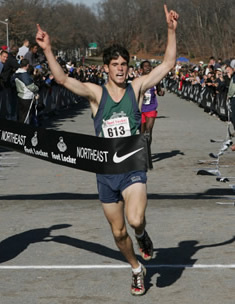 Bronx, N.Y., November 25, 2006 – Craig Forys of Howell, N.J., and Neely Spence of Shippensburg, Pa., won the Foot Locker Cross Country Championships (FLCCC) Northeast Regional at Van Cortlandt Park in the Bronx, N.Y., today. The boys’ race was relatively close until Forys, a senior from Colts Neck High School, broke away from the pack at the 1.5-mile mark. Forys held his lead until Matthew Centrowitz, a senior from Broadneck High School in Arnold, Md., passed him with a quarter mile remaining. Forys then regained the lead, but was challenged by a last-minute sprint by Sintayehu Taye of Ashburnham, Mass., closely at his heels. Forys went on to win the regional title in 15:15. Taye, a junior from Cushing Academy, finished second in 15:18, and Tommy Gruenewald, a senior from Fayetteville-Manlius High School in Manlius, N.Y., finished third in 15:21. Centrowitz finished the race in fifth place, with a time of 15:23. The girls’ race was dominated by a tight pack of runners. At the two-mile mark, Spence, a home-schooled junior, made her move to separate from the pack and secured the lead at the 2.5-mile mark. Spence never relinquished the lead, finishing first in 17:41. Hannah Davidson, a junior from Saratoga Springs in N.Y. and a three-time national qualifier, and Carly Seymour, a junior from Ebensburg, Pa., were close behind to finish second (17:42) and third (17:44) respectively. In the final stretch to the finish, Danielle Tauro of Manahawkin, N.J., collapsed twice and was still able to finish in tenth place, securing a coveted spot to the national finals. Both Forys and Spence are first-time FLCCC national qualifiers. The top ten boys and the top ten girls of the seeded races qualified to compete against runners from the Midwest, South, and West regional meets in the Foot Locker Cross Country Championships National Finals, which takes place Saturday, Dec. 9 at Balboa Park in San Diego, Calif.